VietNamNet Bridge – The Mekong Delta, home to some 18 million inhabitants, is plagued by severe riverbank erosion, which has been blamed on climate change and human factors. An eroded riverbank in the Mekong Delta city of Can Tho. Unrelenting rain last month washed away riverbanks in Hoa Dinh Hamlet in Dong Thap Province’s Lai Vung District, causing several stretches of rural roads to plunge into the river. Some of the stretches were 20 metres long and 3 metres wide, according to a report released by Lai Vung authorities. They have put up warning signs at sites affected by the erosion to safeguard local residents. A 60m section of embankment in Tan Hoa Commune, Vinh Long City (in Vinh Long Province) was eroded, affecting transportation and daily life. There has also been erosion in estuaries along the coast in places like Go Cong Dong (Tien Giang Province), Binh Dai (Ben Tre Province), Vinh Chau (Soc Trang Province), Nha Mat and Ganh Hao (Bac Lieu Province), Vam Xoay Estuary and Rach Roc Estuary (Ca Mau Province). According to the Ministry of Natural Resources and Environment, the delta has nearly 400 erosion-prone riverbanks with a combined length of 600 kilometres. An Giang has 15 of them, threatening over 20,000 families, who have to be evacuated within the next three years. Authorities in Dong Thap have reported that 13 erosion-prone spots where nearly 2,000 families live have been found in the province in the first five months of this year. The province People’s Committee has petitioned the Government for support for its proposal to build 12 new residential areas for resettling people from erosion-prone areas. 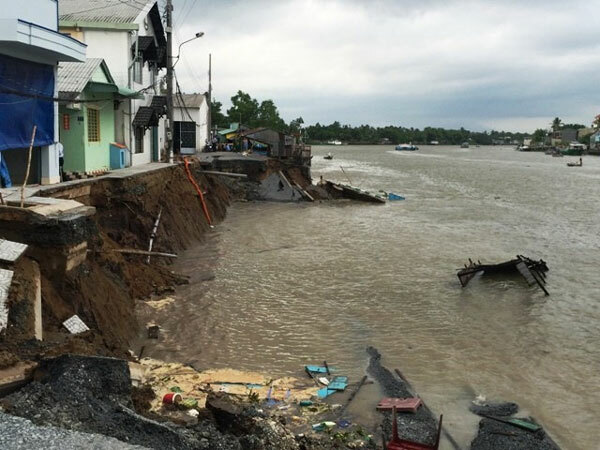 In Ca Mau Province, authorities has reported that over 5,000 families live in erosion-prone areas, mainly in the districts of Tran Van Thoi, U Minh, Dam Doi, Nam Can, and Ngoc Hien, and they need to be moved out immediately. A survey by the Vietnam Institute of Meteorology, Hydrology and Climate Change and the Viet Nam Institute of Geosciences and Mineral Resources found that hydropower dams in upstream Mekong are one of the main causes of erosion in the delta since they retain mud and sand, leading to a shortage downstream. According to To Van Truong, an independent water resources expert, aquaculture farming in coastal areas has seriously affected mangrove forests, causing an ecological imbalance and erosion in many places, while illegal construction encroaching on rivers and hindering floodwaters is another factor. Sand exploitation in rivers is one of the main reasons for their change of flows. In May Deputy Prime Minister Trinh Dinh Dung and Minister of Natural Resources and Environment Tran Hong Ha led a Government working group on a tour to inspect erosion in a number of Mekong Delta localities. Dung said solutions had been adopted in an ad hoc manner due to a lack of reliable scientific research on the issue. He called on ministries and relevant agencies to propose systematic measures to mitigate landslides. He also urged ministries and other agencies to focus on erosion alerts and forecasts, while helping relocated people settle their lives.